Club Penguin Cheats by Mimo777 Club Penguin Cheats by Mimo777: Club Penguin New Pin Cheat... Early! Saweet! For the first time, Club Penguin has given us the pin cheat early! 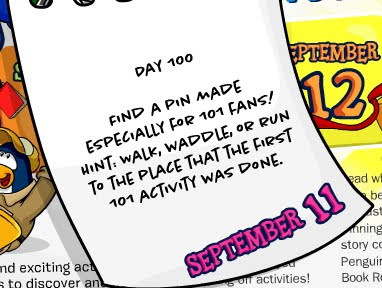 The first 101 Days of Fun said, " Your first activity is hunting for the pin that's hidden on the island! There's a new one every two weeks for you to find! Once you've got the pin, turn blue, put on your ice cream apron, and lead 25 others to it." That pin cheat was found in the Book Room! So, yeah, I think we will find the pin tomorrow in the Coffee Shop or most likely the Book Room. Don't forget to check back here tomorrow for ALL the new cheats! Haven't found it yet. Does anyone else know where it is? U sure i just got on and checked dident see it! The pin will be released tomorrow, not today! Wow, that's a hard clue, but we have to remember where that pin was, and I don't remember!! maybe it's on the mountain because right now at the fair party, there is a ice cream shop on it!!! Interesting, by the way, do you know what the new items for the fair are? 13leej1 said:Interesting, by the way, do you know what the new items for the fair are? Sin Hau Yan replies:maybe it's the purple hat! yours is updated regularly, so i love it! Awesome cheat ;) Early pin cheat; you are Cool, Mimo! Hey there! A Mod is answring your question! ;) Lol.. The pin will be out tomorrow on Friday! It takes hard work and dedication to become CPG Mod. You just answer people's questions, Congratulate Contest Winners and New Mods and put CPG MOD next to your name when you're finished. Check the right sidebar for more facts on the "Become A CPG Moderator" page! Those items will be released tomorrow! But I'm sure there will be the Purple Hats! The pin won't be realeased till tomorrow! I'm sure Mimo will say where. The pin won't be released till tomorrow! But Mimo will show where as soon as it is out. It's easy to become a mod. Just answer people questions, wonderings, mistakes etc. with a comment and say (CPG Mod)) after your name. Hey, how do I play games? Click on the game you want to play and follow the instructions. Mimo posted one already. (The Purple and black hat) Another one is members only, and it is a fake black mustache to go with the ringmaster suit. LOL its out tomorrow not today lol. It's pretty simple! Just answer people's questions or congratulate contest weiners and New Mods! Here's an example form of what I'm doing with your question! i have one cool photo and i whant to send it to mimo and i dont know how.can you help me? MIMO i'm in australia so the pin comes out 1 day before it does for you!!! You have to answer peoples questions to be a mod. You have to put your name and 'Cpg Mod' at the end of your comment, like me. The reason why you didn't find it yet is it's not Friday (or the 100th day of fun) so it won't be out yet! As Mimo said the first activity was finding a pin which was in the coffee shop/ book room. mimo, remember the ice cream pin was in the pizza parlor! not on the book room. I hope it would be a cool pin! P.S Mimo love your site, I go on it every day since almost 2 years now! hope I helped ya! and have phun on Club Penguin! The pin will be released tomorrow, not today! Honestly; when 101 days of fun released; I thought there will be NEW item for just one day; there will be a new party for just one day; and other events... But when I saw first 101 page; I was disappointed, lol! And I only did First 101 days of fun event; that needs to wear ice cream apron and turn blue.. Lol.... cpg mod: foowip... please!!! It is at the cove and it is the fish on the rock! Mimo I have somthing to say about the Koi fish pin. Wasn't it on the the tent side of the cove and now the bottem right? It will not be hidden until tomorow. That is because it won't come out until tomorow. BWA HAHAHA! AWESOME STORY! yea, that's what i was thinking to. Clubpenguin sort of let us all down on it. when 101 days of fun released, the safari hat pin was in the book room. Yup. We know at least the purple hat, and the moustache will be coming. I've heard rumors of the cotton candy, and 3d glasses returning, but no promises. Guess we'll have to find out tonight. Awesome! I love your enthusiasm. So you can't be a mod by asking, but you can become one by answering other peoples questions and comments regularly, and putting "Your Name Here" (CPG MOD) at the end of every answer... like this. THat is pretty good. I'm pretty bad at that game to be honest lol. last time i played, i played for about 10 minutes and only got 7 tickets. LOL! Actually oddly it doesn't. Everything goes on clubpenguin the exact same time, all over the world. It comes on at 12 AM for me, which would be (just guessing) about 9 or 10 AM your time. I thought the first activity was to get the pin and the pin was at the pizza parlor(ice cream pin) and that is why they said put on your ice cream apron? To almost everyone. The pin will be released tomorrow. Not today! The first activity was in the Pizza Parlor. And that's where the pin is. the ice cream pin is not in the book room. it is in the pizza parlor. and the one at the book room is the hat. yeah! It was actually in the Pizza Parlor!